In January 2017, Shriram Properties, one of the leading real estate companies, donated mid-day meal delivery vans (also known as the blue bus) to Akshaya Patra. The vans are valued at Rs 32 lakhs and are equipped to maintain a dust-free environment and optimal temperature to retain the freshness of meals. 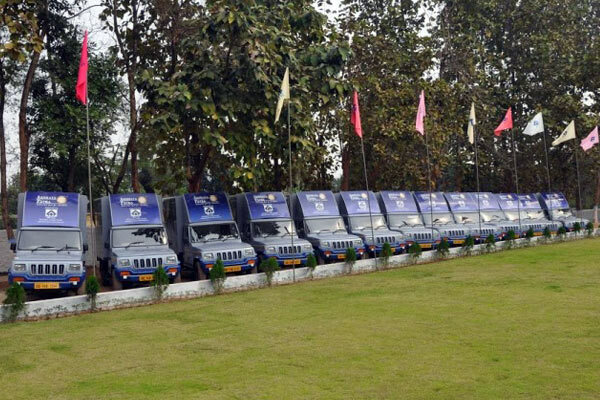 “The vehicles will help the Foundation in catering to the daily mid-day meal requirements of 5,000 kids at 10 primary schools in Bengaluru,” said Murali M, Managing Director of Shriram Properties. The blue bus is a customised transport vehicle specially designed to deliver food that is packed in stainless steel 304 Grade vessels which can keep food hot and fresh for long intervals of time. Every vehicle is steam-sterilised before the loading process. To know more about our delivery vans, click here.